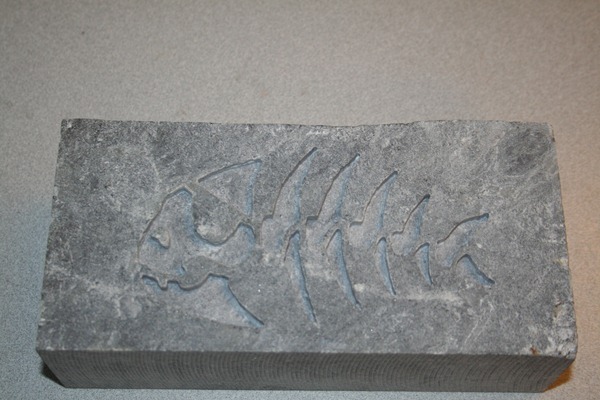 The fact that this fossil appears in metamorphic soapstone is proof positive of divine noodley intervention. Ohio’s giant Touchdown Jesus statue was hit by lightning and burned to the ground last night. A six-story-tall statue of Jesus Christ with his arms raised along a highway was struck by lightning in a thunderstorm Monday night and burned to the ground, police said. 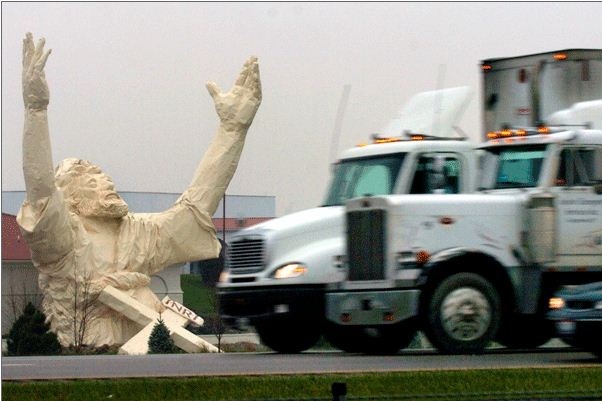 The sculpture, 62 feet tall and 40 feet wide at the base, showed Jesus from the torso up and was nicknamed Touchdown Jesus because of the way his arms were raised, as though reaching out to catch a football. It was made of plastic foam and fiberglass over a steel frame, which is all that remained early Tuesday. Google tells me that many Jesus statues have been struck down by lightning. As far as I know there have been no FSM statues destroyed. 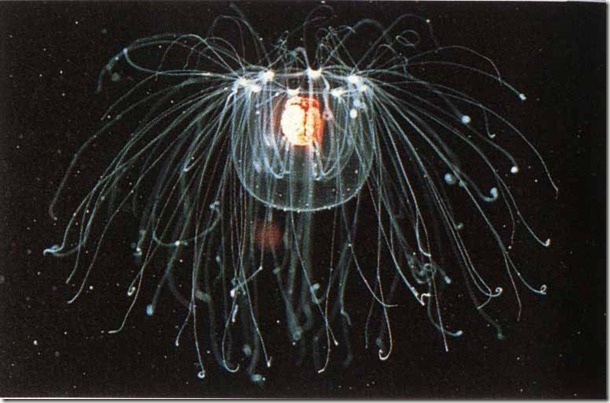 Meringue corresponces found between phyto planktons and the Flying Spaghetti Monster! That microcosmic creature is sailing in sea using carbon dioxide from fleck atmosphere to grown. It’s very rapidly reacting in its environment. I didn’t find any direct link within pirates, but under the climate change autothrophs could get lower photosynthesis levels to survive. His Noodliness caught in the act! 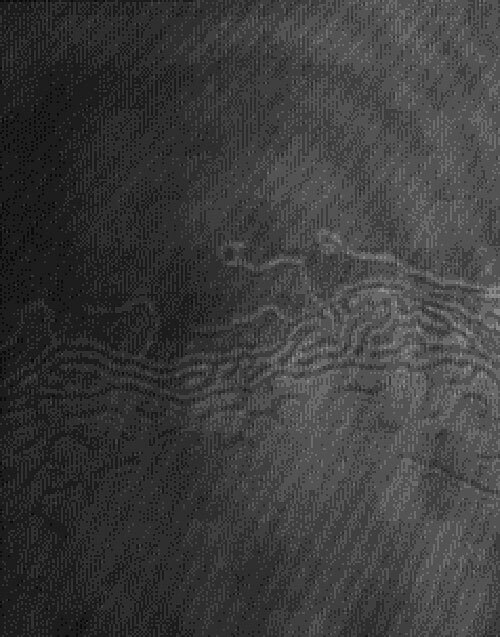 Yesterday, while examining my U251 cells under the fluorescence microscope, I was blessed with his Noodly Appearance. Although a truly fierce believer in His Holiness, I admit to always have doubted the suggestion of the Pastafarian Scholars (E.g. Bobby Henderson) regarding the FSM tempering with scientific data, in order to put humanity on a wrong track regarding His existence. They argued that for instance by creating the fossils, His Noodliness wished to find out who the true believers were. The latter are only those holding on to Pastafarianism and totally rejecting the idea of natural evolution in spite of seemingly sound scientific evidence, goes the argument. "What rationalizing nonsense! ", I was thinking. 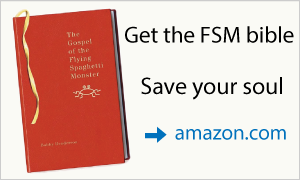 "Why would the FSM go to such lengths in order to actually MINIMIZE his congregation, since undoubtedly the evolution hypothesis has lead to massive defection amongst his former followers." But as of yesterday, I humbly accept the wisdom of the Prophet and the mysterious ways of The Flying Spaghetti Monster. Ramen! I was presented with the irrefutable proof of His tempering with scientific data. 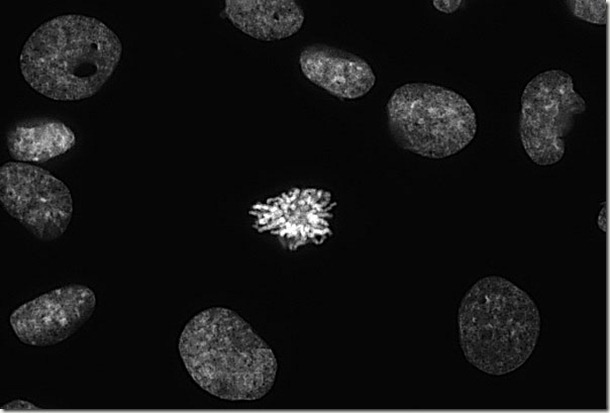 I cannot fathom why He should bother with the poor DAPI-stained nuclei of the U251 cells from a diploma student, but truly limited is my perception as a meek non-pirate of His thinking, may His Noodliness forgive me. 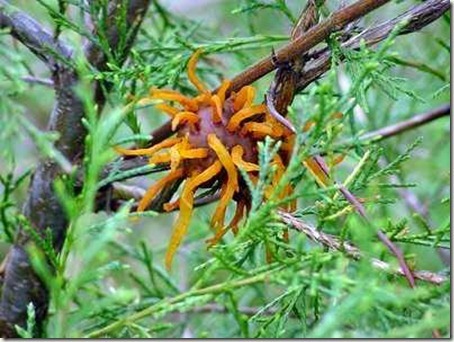 Every year about this time, mysterious strangers hang multiple Orange FSM ornaments on our cedar trees. Very interesting! I had to post all the photos Karen sent. 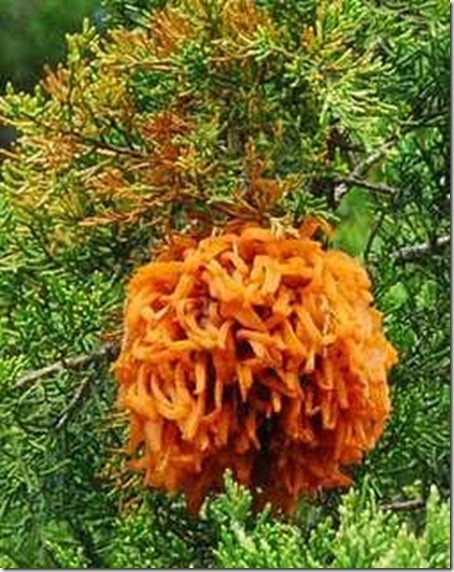 (Unenlightened) scientists would have us believe these noodly orbs are Ceder-Apple rust on Eastern Red Cedars. You can decide for yourselves. I’ve attached a couple of photos I took on the 25th of February here in Tampere, Finland. I also submitted these photos to a local newspaper, which turned the whole thing as somewhat of a small phenomenom with numerous other people commenting that they saw the same thing. Some people even sent the paper additional photos. Here‘s the link to the news story. 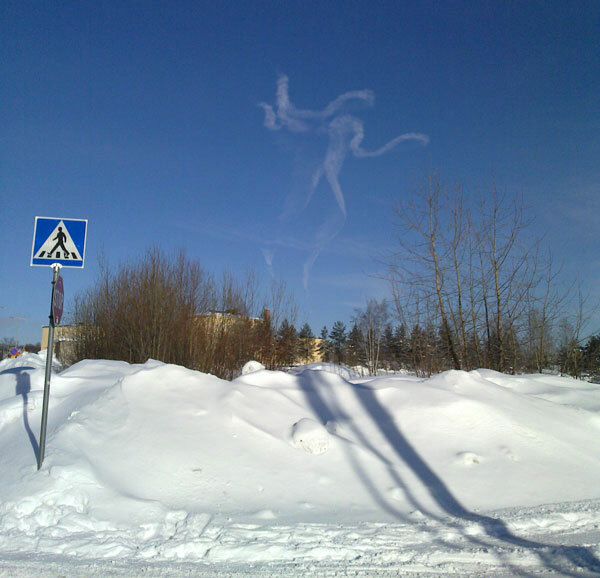 Most of the people speculating the article were certain that the formation in the wintery sky was either chemtrail from fighterjets or an angel (yeah right). Only a couple commenters we’re able to point out that this is clearly FSM. Or Cthulhu. I thought all Pastafarians might enjoy some scientific evidence :) So there you go – a thin polymer film at the air-water interface. 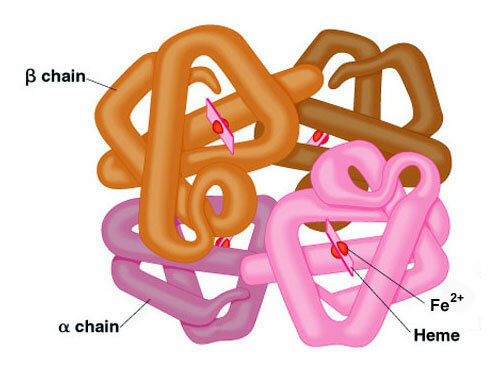 This is a hemoglobin structure; it is what carries oxygen in blood. 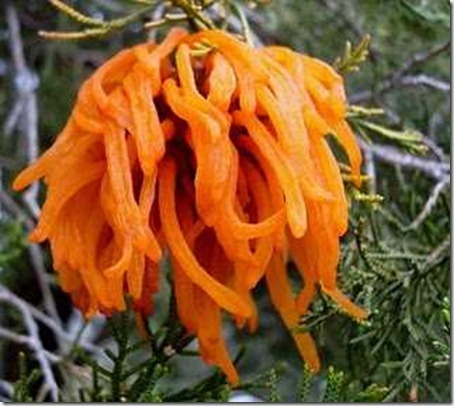 It very closely resembles His Noodliness, which proves that His Noodliness is in us all, supplying our cells with oxygen and divinity. 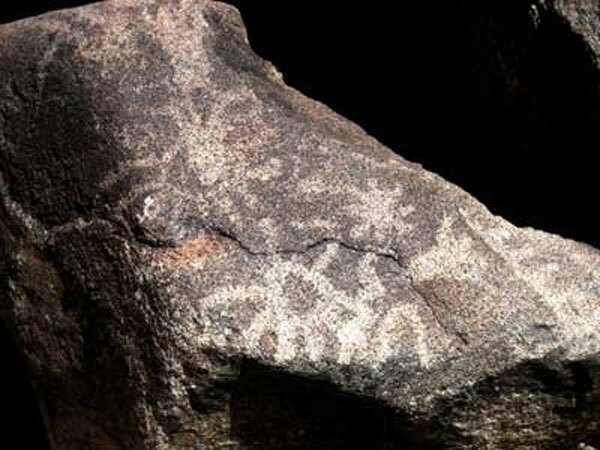 This photo of a petroglyph on a rock in Arasona shows that the FSM was here earlier than we knew. The boulder is located in White Tanks Regional Park, Phoenix, Az and it has been misidentified as a supernova. 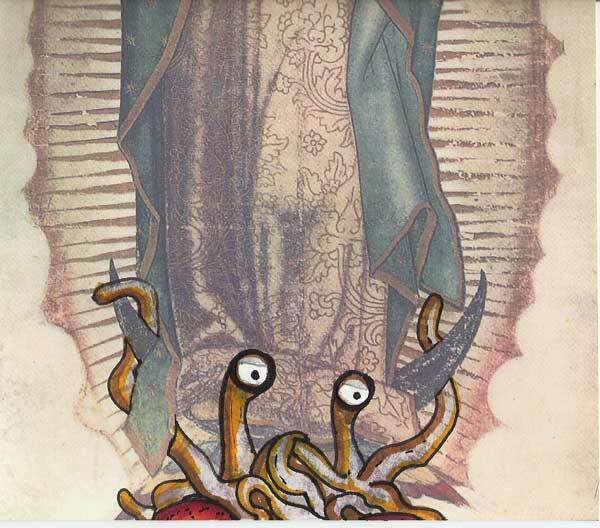 We’re working hard at spreading the message of the Holy Flying Spaghetti Monster throughout Mexico and Latin America. 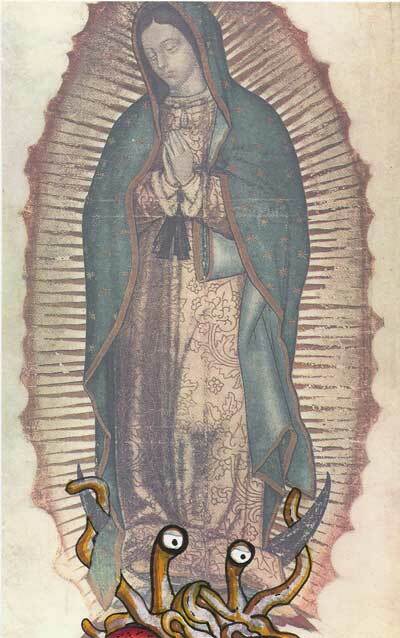 You might know that the Virgin of Guadalupe is the holiest figure of the Mexican catholic religion – but things have changed. 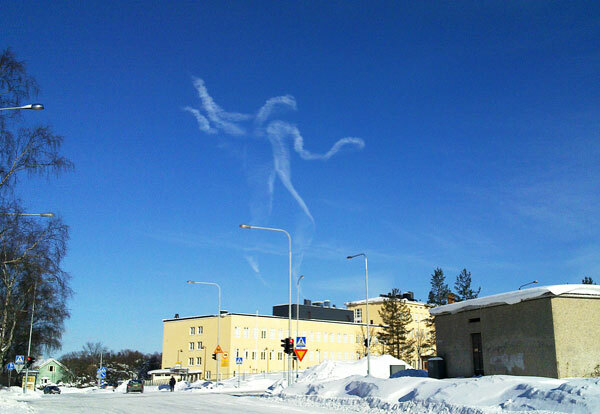 Now we know that the FSM is also present in one more of the many far away lands. Attached is an image of our findings. We hope you enjoy it! Bendito sea el Monstruo de Spaghetti Volador! 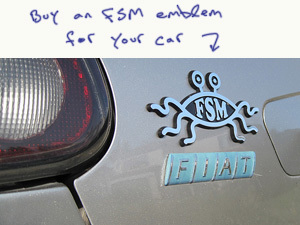 (blessed be the FSM). Subscribe and get Pastafarian news and articles by email. Your info will be kept private and I won't bug you often, promise. We do not solicit or accept donations -- the Church is funded by orders of Ordination Credentials. 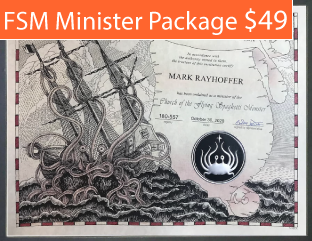 Please consider taking the next step of your Faith and become an FSM Minister. Kiva is a platform where you can make small interest-free loans to people in poor areas that need help starting small business. 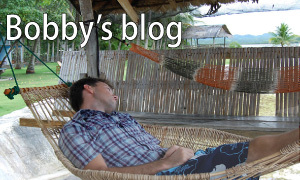 The Church of the FSM has one of the top religious congregation teams on Kiva. Check it out. Please help us stay ahead of the Mormons! We have a few styles here. 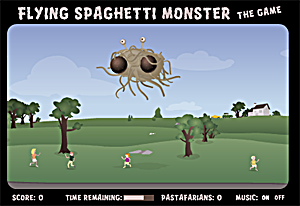 An elaborate spoof on Intelligent Design, The Gospel of the Flying Spaghetti Monster is neither too elaborate nor too spoofy to succeed in nailing the fallacies of ID. It's even wackier than Jonathan Swift's suggestion that the Irish eat their children as a way to keep them from being a burden, and it may offend just as many people, but Henderson puts satire to the same serious use that Swift did. Oh, yes, it is very funny. -- Scientific American. » Pastafarians Marching For Science -- Contradiction?